Join the discussion on our forums! Come discuss Necrium Vial over in our dedicated Necrium Vial discussion topic. Trigger a friendly minion's Deathrattle twice. Two near-death experiences for the price of one! I can see my dreams being shattered when I have to play against this.. Does this card count as a deathrattle card for Roll the Bones? I have played so much deathrattle rogue but never took notice. I think it does trigger Onyx Spellstone though. In experience, cards with only the "Deathrattle" card type triggers roll the bones and onyx spellstones. That includes Necrium Blade and Kingsbane. im definitely going to try the Leeroy Jenkins + Carnivorous Cube OTK. can't think of a good death rattle minion that has a death rattle good enough to be worth 5 mana and a card to triger twice. Maybe cube but that's a 10 mana combo. The egg Hunters will try egg Rogue i'm sure. ya difference is play dead costs 1 mana, you're playing 4 extra mana for that 5/5 and can't reliably pull it off till turn 8. You could use preparation. I don't think it'll be good but you could do it. Where is the Necrium Toothpaste? obviously the benefits of this card don't shine through in every situation, but in ones where 2 mana could make or break a combo (that needs 4 triggers) i think this is a significant improvement over what hunter has had access to. EDIT: Slight correction to the flavor text, it's two near-death experiences for the price of five. Ah, it's one of those cards that makes people type "Deathrattle" into a search bar and post what they come up with. Now you have 4 mana to cast any 2 spells that can go face. There are lots of options not just Sinister Strike. If you are DK you actually need only 1.
why not Blightnozzle Crawler ? 5 mana double Assassinate seems good. it's one way to reliably get the token without needing for the Blightnozzle Crawler survive a turn. Carnivorous Cube: 5 mana summon 4 copies of a minion. Sounds pretty good, but I don't think Rogue has enough support for Cube to justify running this. Kobold Illusionist: When you have something tasty in hand like Malygos. Illusionist --> Prep --> Vial out 2 Malygos --> Eviscerate --> Sinister Strike --> Sinister Strike is a 10 mana deal 40 damage, Cool OTK, but it's quite impractical when you factor in you need to empty your hand of minions to make this play. Mechanical Whelp: 11 mana, 2 card combo, but it allows you to get 5 mana 14/14 worth of stats. 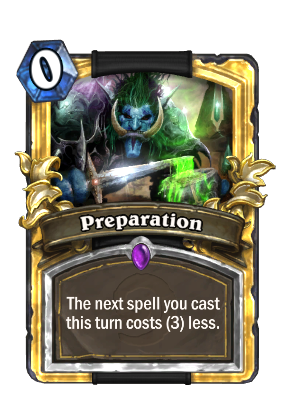 To get this to work, however, you need either a Coin, Prep, or for your Whelp to stay on the board for one turn and NOT die. Ultimately, it just doesn't seem like 5 mana for 2 Deathrattle pops isn't worth it just yet. 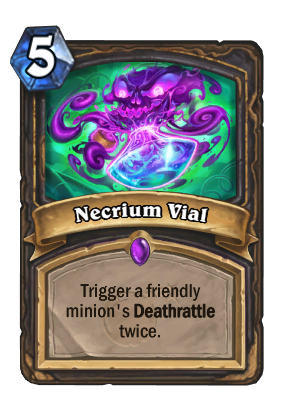 That said, I am looking forward to that one time where some guy goes Mechanical Whelp --> Preparation --> Necrium Vial --> Prep --> Necrium Vial for the 10 mana 30/30 worth of stats. One way to make the meme more reliable is if you Whelp --> Master of Disguise the Whelp so it has Stealth. Now they can't target the whelp, so it's much harder for them to kill it... unless they want to spend a board clear just to kill a 2/2.